The flag of Azerbaijan (Azerbaijani: Azərbaycan bayrağı) is a horizontal tricolour featuring three equally sized fesses of blue, red, and green, with a white crescent and an eight-pointed star in the center. The tricolour replaced an earlier design used by the Azerbaijan SSR. The blue symbolizes Azerbaijan's Turkic heritage, the red stands for progress, and the green represents Islam. The official colors and size were adopted on 5 February 1991. This flag was used from 9 November 1918 to 1920, when Azerbaijan was independent, and it was revived with slight variations on 5 February 1991. The nickname for the flag is Üçrəngli Bayraq, which means The Tricolour Flag. The flag is referred to in the Constitution and mentioned two times in the national anthem. On land, the flag is used as the civil, state and war flag; at sea, it is used as the civil, state, and naval ensign, as well as the naval jack. The flag also has official status in the Nakhchivan Autonomous Republic. A presidential decree declared 9 November, the date when in 1918 this flag was adopted as the national flag of Azerbaijan Democratic Republic, as the national Flag Day. State flag of the Azerbaijan Republic consists of three horizontal stripes of same width. Upper stripe is blue, middle stripe is red, and the lower one is green; in the middle of red stripe on both sides of the flag white crescent with eight-pointed star are depicted. Width of the flag constitutes half of its length. Further specifications of the national flag were detailed in the Presidential Decree "On the National Flag of the Republic of Azerbaijan" issued on 5 February 1991. The ratio was kept at 1:2, which was used in the Soviet era. Each stripe is one-third of the total height of the flag and extends the full length. The star and crescent were placed in a box that has a ratio of 3:4; the crescent is shifted one-sixtieth from the center. The outside diameter of both the crescent and the red inside circle intersects with the diameter of the star. The diameter of the star is one-sixth the height of the flag; the inscribed circle in this star is one-twelfth the height of the flag. The flag is also described in the technical specification "AZS 001-2006. Azərbaycan Respublikasının Dövlət Bayrağı. Texniki şərtlər." published by the State Committee on Standardization, Metrology and Patents of the Republic of Azerbaijan in 2006. The state flag of the Azerbaijan Democratic Republic made by the first President of the Azerbaijani National Council Mammed Amin Rasulzade and his wife. Displayed at the Museum of History of Azerbaijan. The sky blue symbolizes Turkic Multinationalism, the red is for the progress to establish a modern state and the development of democracy, and green shows the nation's relation to the Muslim world. In the middle of the flag, and appearing on both front and back, are a white crescent and an eight-pointed star. The first President of the Azerbaijani National Council Mammed Amin Rasulzade noted in his speech, at the parliament's session of the Azerbaijan Democratic Republic, that the colors relate to Turkic freedom, modernity, and Islamic culture. The composer of the anthem of Azerbaijan Uzeyir Hajibeyov includes in the song references to the meaning of the flag: blue for Azerbaijan's multinationalism, red for progress and culture, and green for Islam. According to historian Nasib Nasibli, Ali bey Huseynzade, one of the ideologists of Azerbaijan's independence, developed the combination based on colors used in 1895. While the crescent and star are typically seen as markers of Islam, some historians and researchers disagree about why an eight-pointed star is used on the flag of Azerbaijan. Fatali Khan Khoyski points to the eight letters in the word "Azerbaijan" as written in Arabic. The eight points of the star are also thought to stand for the eight Turkic peoples of Azerbaijan. The problem is there are only seven Turkic peoples: Azeris, Ottomans, Jagatais, Tatars, Kipchaks, Selijuks, and Turkomans. It's possible the Kipchaks actually reflect two peoples, the Kazakhs and Kyrgyz, which would make eight. The classification of Turkic peoples pre-Soviet era was different from what it is today. In 1828, after the last Russo-Persian War, several Khanates of the Caucasus were annexed to the Russian Empire . When the Russian Empire collapsed, Russian Azerbaijan declared its independence and joined the short-lived Transcaucasian Democratic Federative Republic, together with Georgia and Armenia. This unified state hardly lasted a year and was soon dissolved. Since the Republic was short-lived, it did not use any flags or symbols. Nevertheless, some historians consider a horizontal gold, black, and red tricolor, similar to that of the German flag but arranged differently, to have been flag of Transcaucasia. The federation was dissolved on 26 May 1918, when Georgia declared its independence as the Democratic Republic of Georgia. Both Armenia and Azerbaijan declared their independence two days later, on 28 May 1918, as the First Republic of Armenia and the Azerbaijan Democratic Republic, respectively. The first meeting of the Parliament of Azerbaijan Democratic Republic, which raised the national flag for the first time on 7 December 1918. After gaining independence, the blue-red-green tricolour was adopted by the government of the Democratic Republic of Azerbaijan on 9 November 1918. Azerbaijan was the first modern democratic state in the Muslim world. The Azerbaijan Democratic Republic lasted only 23 months until the Bolshevik 11th Soviet Red Army invaded it, establishing the Azerbaijan SSR on 28 April 1920. Although the bulk of the newly formed Azerbaijani army was engaged in putting down an Armenian revolt that had just broken out in Karabakh, Azeris did not surrender their brief independence of 1918–20 quickly or easily. As many as 20,000 Azerbaijani soldiers died resisting what was effectively a Russian reconquest. On 12 March 1922, the Azerbaijani SSR united with the Georgian SSR and the Armenian SSR under the Transcaucasian SFSR. On 30 December 1922 the Transcaucasian SFSR became one of the four Soviet republics that united to form the USSR. The flag of the republic had a hammer and sickle inserted into a star with initials ЗСФСР written in Russian sans-serif script. These letters stand for Закавказская Советская Федеративная Социалистическая Республика. In 1936, the TSFSR was broken up into its three constituent regions, which were named the Azerbaijani SSR, the Georgian SSR, and the Armenian SSR. During the Soviet rule, Azerbaijan SSR had eight different flags. Most of the flags only had slight differences. The adaptations were the result of the disastrous early years of the Soviet Union in the Caucasus. The first unofficial Soviet Azerbaijani flag was used when Russians conquered Baku on 28 April 1920. The national flag of Azerbaijan Soviet Socialist Republic is a panel consisting of two horizontal bands of color: the upper red part of three quarters of the width and the bottom is blue, nearly one quarter the width of the flag with the image on the top left corner of the red band, at the flagpole and gold hammer and sickle, and above them a red five-pointed star framed by gold fringe. The ratio of width to length is 1:2. Flag of the Nakhchivan ASSR introduced in 1937 with both Azerbaijani and Armenian text. It fell from use in the 1940s when the Azerbaijani Latin alphabet was replaced with Cyrillic characters. Flag from 1952-1991. The 1952 flag featured a different hammer and sickle style up to 1956. National Flag Square in Bayil, Baku. During the Soviet period, Jahid Hilaloglu raised the tricolor over Baku's Maiden Tower in 1956 showing his defiance towards the system. Hilaloglu was ultimately sentenced to four years of imprisonment and his supporter Chingiz Abdullayev was institutionalized. On 28 May 1952 during the Republic Day celebrations in Germany, Mammed Amin Rasulzade raised the tricolor and asked for anyone who can be entrusted to take the flag back to Azerbaijan. Gulmirza Bagirov ultimately brought it to Azerbaijan in secret in the 1970s; this flag was hung over his house in Maştağa on 20 January 1990. During the late 1980s, unrest in Soviet Azerbaijan, the tricolor Azerbaijan Democratic Republic flag was used in demonstrations calling for independence. On 17 November 1990 on the first session of the Supreme Assembly of the Nakhichevan Autonomous Republic, the 1918 Azerbaijani flag was adopted as the national flag of the autonomous state. This flag was later adopted when the decree, "On change the name and national flag of Azerbaijan SSR", was issued on 29 November 1990. The decree was ratified on 5 February 1991 by the National Assembly of the Republic. The first constitution since independence was adopted on 12 November 1995 after a national vote; one of the articles which described the three-color flag of the republic. On 17 November 2007, the Azerbaijani President issued a decree "On creation of the National Flag Square" in Baku. The square has a flag pole with a mass of 220 tons and a height of 162 meters. The flag that is flown on this pole has an area of 2,450 square meters; the size of the flag itself is 35 meters wide and 70 meters long and weighs 350 kilograms. A museum dedicated to the national flag was also built at this flagpole. On 1 September 2010 the flag was officially raised to open the museum; subsequently this flag pole became the world's tallest unsupported flagpole, until being overtaken by the 165 meter Dushanbe Flagpole, Tajikistan. In 2009, 9 November was officially declared the National Flag Day. This day is set aside to respect the flag, its history (the Azerbaijan Democratic Republic first adopted the current tricolour on 9 November 1918) and its symbolism. Traditionally, the flag of the Azerbaijan plays a role in military funerals, and occasionally in funerals of other civil servants (such as law enforcement officers, fire fighters, and Azerbaijani presidents). Bu gög boya gög moğoldan qalmış bir türk nişanı, Bir türk oğlu olmalı. Yaşıl boya islamlığın sarsılmayan imanı, yürəklərə dolmalı. Şu al boya azadlığın, təcəddüdün fərmanı, mədəniyyət bulmalı. The expression by Mammed Amin Rasulzade (Azerbaijani: "Bir kərə yüksələn bayraq, bir daha enməz! "; "The flag once raised will never fall!") was the rallying cry of Azerbaijani independence in early 20th century. In 1919, Jafar Jabbarli wrote "To Azerbaijani flag" poem in dedication to the state symbols of Azerbaijan. The national flag is also mentioned in the national anthem of Azerbaijan, "March of Azerbaijan" in the fifth and fifteenth sentences. The unofficial English translations of the sentences come out to "With three color banner live happily!" and "To hold high your honored flag." Personnel of the Azerbaijani Armed Forces at 2010 Moscow Victory Day Parade. The athletes from Azerbaijan entering the stadium with flag at the opening ceremonies of the 2010 Winter Olympics. Mil Mi-8 with Azerbaijani flag. Azerbaijan flag during a 2012 Summer Olympics wrestling medal ceremony. ^ "Article 23. Azerbaijan State Symbols". The Permanent Mission of Azerbaijan to the United Nations. Archived from the original on 7 October 2011. Retrieved 6 June 2011. ^ a b c "National flag of Azerbaijan". CRW Flags. 17 June 1999. Retrieved 17 June 2009. ^ a b c "Azerbaijan marks National Flag Day". Today.az. 9 November 2012. Retrieved 14 November 2012. ^ a b c Article 23.II of the Constitution "The Constitution of the Republic of Azerbaijan". Official website of the President of the Republic of Azerbaijan. 2002. Archived from the original on July 30, 2013. Retrieved May 28, 2011. ^ a b c d Флаг Азербайджана (in Russian). Geraldika.ru. Retrieved 6 June 2011. ^ 5 февраля 1991 года Верховный Совет Азербайджанской Республики Законом №14-XII утвердил изменение названия государства и Законом №17-XII утвердил изображение Государственного флага и Положение о Государственном флаге Азербайджанской Республики. ^ "AZS 001-2006. Azərbaycan Respublikasının Dövlət Bayrağı. Texniki şərtlər" (in Azerbaijani). Azərbaycan Respublikasının Standartlaşdırma. ^ a b ""Azərbaycan Respublikası Dövlət bayrağının istifadəsi qaydaları haqqında" Azərbaycan Respublikasının Qanununda dəyişiklik edilməsi barədə" (in Azerbaijani). Azərbaycan Respublikasının Milli Məclisi. ^ Find a PANTONE color. Pantone LLC. Pantone Color Picker [Retrieved 9 December 2009]. ^ "Azerbaijan State Symbols". Embassy of Azerbaijan to Canada. Archived from the original on 15 November 2010. Retrieved 6 June 2011. ^ "Azerbaijan State Symbols". Government of the Republic of Azerbaijan. 2007. Retrieved 9 June 2011. ^ Hajibeyov, Y. (1919). "number of May 28,". One Year. Azerbaijan. ^ a b "What does the crescent and eight-pointed star on the national flag of Azerbaijan stand for?". Azerbaijan Press Agency. Archived from the original on 25 March 2012. Retrieved 7 November 2008. ^ a b Сабухи Ахмедов, Государственный флаг Азербайджанской Республики(in Russian), citing Мярданов М., Гулийев Я., Азярбайъан Республикасынын дювлят рямзляри. 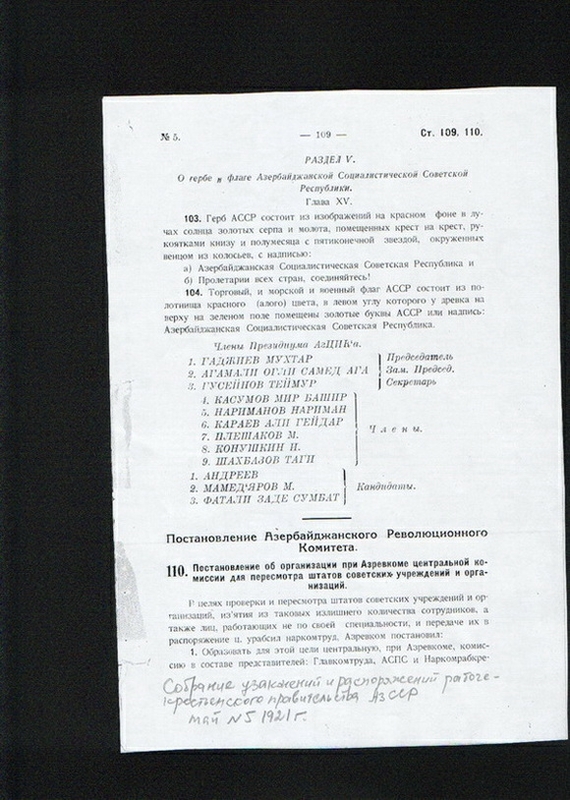 Б., 2001, pp. 74–75. ^ Sache, Ivan. "Meaning of the flag of Azerbaijan". Intute. Retrieved 17 June 2009. ^ "Закавказская Федерация (Transcaucasian Democratic Federative Republic)" (in Russian). Russian Centre of Vexillology and Heraldry. 30 May 2003. Archived from the original on 22 June 2006. Retrieved 27 December 2006. Признать флагом Азербайджана флаг, изготовленный из красной материи с изображением белого полумесяца и белой восьмигранной звезды на красном фоне. ^ "Article 23. Azerbaijan State Symbols". President of Azerbaijan. Archived from the original on 16 January 2013. Retrieved 14 November 2012. ^ Tadeusz Swietochowski. Russia and Azerbaijan: A Borderland in Transition. Columbia University Press, 1995. ISBN 0-231-07068-3, ISBN 978-0-231-07068-3 and Reinhard Schulze. A Modern History of the Islamic World. I.B.Tauris, 2000. ISBN 978-1-86064-822-9, ISBN 978-1-86064-822-9. Citations are at Talk:Azerbaijan Democratic Republic#First or second. ^ Джангировичем Салахлы, Чингизом. Ассамблея уставов и распоряжений рабоче-крестьянское правительство Азербайджанской ССР, № 5, Май 1921 (in Russian). рабоче-крестьянского правительства АзССР, №5. Retrieved 1 May 2009. ^ Janmammadova, Aygun (7 September 2010). "Azerbaijan: Baku welcomes the world's highest flag… and a strong wind". Global Voices. Retrieved 6 July 2011. ^ Abbasov, Rafael (29 May 2010). "Tallest unsupported flagpole". Guinness World Record. Archived from the original on 19 December 2015. Retrieved 29 May 2010. ^ a b ""Azərbaycan bayrağına" (Cəfər Cabbarlı)". www.azadliq.org (in Azerbaijani). Retrieved 10 November 2014. ^ "Dalğalanan bayraqlar" (in Azerbaijani). Medeniyyet. Archived from the original on 27 June 2011. Retrieved 30 May 2009. ^ "National Anthem of the Republic of Azerbaijan". Embassy of the Republic of Azerbaijan in the People's Republic of China. Wikimedia Commons has media related to Flags of Azerbaijan. This page was last edited on 8 February 2019, at 15:54 (UTC).